Botany has recently acquired a unique collection: a special group of calcified red algae known as the corallines. 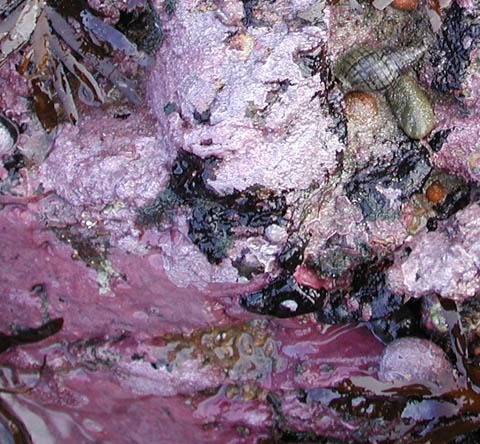 Coralline algae are abundant and ubiquitous throughout the world’s oceans, playing very important roles in marine ecosystems. The encrusting, or crustose, species can form unusual lumpy, warty-looking layers in the intertidal, sometimes completely covering rocks. Perhaps you have noticed this interesting ‘pink paint’ on the rocks at the beach this summer? Despite being an ecologically important and colourful element of the marine flora, the diversity of crustose coralline species in New Zealand is only beginning to be understood. 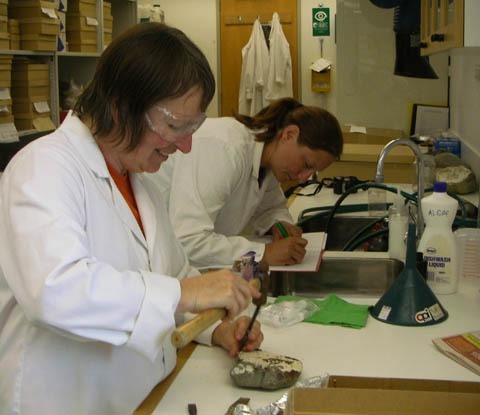 In 2002, a team of researchers led by Wendy Nelson at NIWA (Wellington) began a project studying this group of red algae. They have published their results in a detailed field guide and deposited the comprehensive reference collections generated through their research at Te Papa. Collecting and studying coralline algae requires some unusual techniques (hammers and chisels are standard collecting and sampling gear! ), but the specimens also require special attention once in the herbarium. 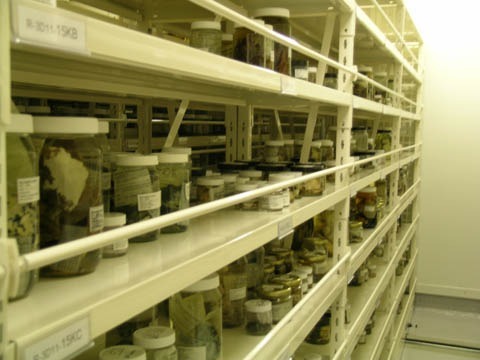 Although some are dried like the other botany specimens, most of the samples are stored in jars in a specially prepared mix of ethanol and glycerol to best preserve the reproductive structures which are needed to identify the different species. Being in alcohol, the collections then need to be stored safely. We have recently transferred these collections to Te Papa’s purpose-built liquid storage facility at the Tory St. site, the final stage in making the corallines a permanent part of the collection. Researchers from the University of Otago’s Department of Marine Science were quick to take the opportunity to access these new coralline collections, recently visiting to obtain a few samples for their research. Dr. Abigail Smith and her associates study how the mineralogical composition of calcified organisms changes in response to decreasing ocean pH due to global climate change. A recent subject of their research has been the coralline algae.